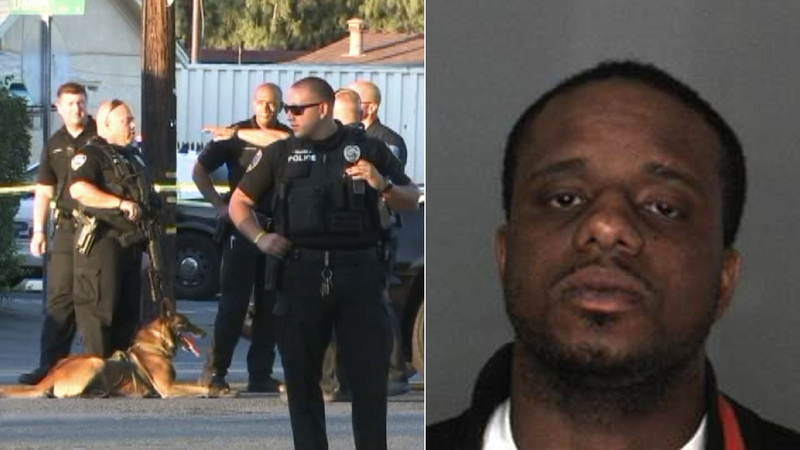 Arthur Felder, 28, was shot by police near Foothill Boulevard and Meridian Avenue in San Bernardino Saturday, Mar 2, 2015. SAN BERNARDINO, Calif. (KABC) -- An armed suspect was hospitalized in stable condition after being shot by police in San Bernardino Saturday night. Police received a call about a man with a gun near Foothill Boulevard and Meridian Avenue at about 6:06 p.m. and found three suspects who then ran eastbound through an alley. A responding officer observed the suspects running and stopped his patrol car in front of the suspects. As one of the suspects turned, the officer spotted the suspect's semi-automatic handgun in his hand and an officer-involved shooting occurred. Arthur Felder, 28, was shot by officers three times in the shoulder, buttocks and foot. The suspect was transported to Arrowhead Regional Medical Center where he was treated and released. A fully-loaded Desert Eagle .40 caliber handgun was found at the scene. The handgun had been stolen from Phoenix. Felder was arrested for assault with a deadly weapon on an officer, felon in possession of a firearm, possession of cocaine for sales, possession of cocaine while armed with a firearm, participation in a criminal street gang and a parole violation. The two additional suspects fled the scene. No officers were injured. Anyone with further information was urged to contact the San Bernardino Police Department.